Tariq Devega (born July 26, 1990), better known by the stage name ASAP Nast (stylized as A$AP Nast), is an American model, hip hop recording artist and songwriter from Harlem, New York. Nast is best known as a member of the hip hop collective A$AP Mob, along with fellow Harlem-based rappers A$AP Rocky and A$AP Ferg. As part of A$AP Mob, they released their first project as a group, a mixtape titled Lord$ Never Worry in 2012. His breakout song, "Trillmatic" featuring Wu-Tang Clan's Method Man was released on December 4, 2013. 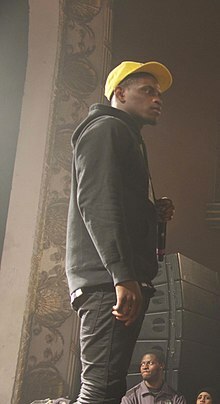 ASAP Nast was raised in West Harlem, New York City on 116th and Morningside Avenue, and frequently spent time with his cousin ASAP Rocky when they were children. When Rocky moved to The Bronx as a teen, the two lost contact, but were reunited by ASAP Bari, one of ASAP Mob's founding members. Nast went to Martin Luther King, Jr. High School in Manhattan. However, he dropped out before he graduated due to him knowing he wanted a career in music. Following dropping out of high school, he worked at the sneaker store Atmos. ASAP Nast was one of the first members to join the hip hop collective ASAP Mob, that was formed by ASAP Yams, ASAP Bari and ASAP Illz in Harlem during 2007. He was originally known by the name New York Nast, however he adjusted his stage name to include the ASAP prefix, as all the other Mob members have; aside from Dash. Nast made his official debut on ASAP Rocky's early song "Uptown" and then he appeared on two Live.Love.ASAP songs, "Purple Swag: Chapter 2" and "Trilla". On August 27, 2012, ASAP Mob released their debut project, a mixtape titled Lords Never Worry, as a free download. Nast appeared on four of the mixtape's tracks, including the standout "Black Mane". Following the mixtape's release, Nast toured with the rest of ASAP Mob. Throughout that tour they performed 48 shows in 61 days, the majority of which were sold out. Singer Tinashe released the remix to her song "Who Am I Working For?" on April 16, 2013, featuring Nast. In July 2013, ASAP Ferg announced that ASAP Mob would release their debut album after the release of his solo debut album Trap Lord. During October 2013, ASAP Nast along with ASAP Rocky, Ferg, Twelvy and Ant, participated in the ASAP Mob's cypher during the 2013 BET Hip Hop Awards. On December 3, 2013, it was announced that the album would be released on March 4, 2014. The following day, the album's first single, "Trillmatic" by ASAP Nast, was released along with an accompanying music video. The single, produced by ASAP Ty Beats, features a verse from American rapper and New York City-native, Wu-Tang Clan's Method Man. It had previously been previewed at the end of the music video for ASAP Ant's song "The Way It Go". The single was met with generally positive reviews from music critics. The album was then changed to be titled L.O.R.D.. It has been predicted that L.O.R.D. could've resulted in Nast being the next breakout member of the group. Originally, he was being considered for the 2014 XXL freshman class, but was not added. L.O.R.D. was expected for a 2014 release, however, ASAP Mob leader, the late ASAP Yams announced on his Tumblr account that the album was officially scrapped. Complex said that ASAP Nast's style is deeply rooted in 1990's East Coast hip hop, omitting the trap and southern hip hop influence that some other ASAP Mob members have. Vibe called him a brash, rapid-fire rhymer. He has been credited as able to "adapt his flow to match beats of all styles and eras." His verses are usually boastful and full of multi-syllable rhyme schemes. ^ a b c d e / 00:00 (2014-02-03). "Crew Love: A$AP Mob". Hotnewhiphop.com. Retrieved 2014-03-25. ^ a b J. Pablo Tue., Aug. 28 2012 at 2:00 PM (2012-08-28). "Meet The A$AP Mob: Talking To Ant, Ferg, J. Scott, Nast, Twelvy, And Yams". Blogs.villagevoice.com. Retrieved 2014-03-25. ^ a b "TV: Meet the ASAP Mob". Vibe. 2013-09-10. Retrieved 2014-03-25. ^ "ASAP Rocky ft. ASAP Twelvy & ASAP Nast - Trilla | Stream & Download". DJBooth.net. Retrieved 2014-03-25. ^ PEDRO says: (2011-09-19). "ASAP Rocky f. ASAP Nast and ASAP Twelvy, "Trillamatic" MP3". The Fader. Retrieved 2014-03-25. ^ Pelly, Jenn (August 27, 2012). "Download the New Mixtape Lords Never Worry From A$AP Rocky's A$AP Mob". Pitchfork Media. Retrieved August 28, 2012. ^ a b "A$AP Nast — 25 New Rappers to Watch Out For". Complex. Retrieved 2014-03-25. ^ "Mob Ties: Meet A$Ap Nast". Vibe. 2012-11-28. Retrieved 2014-03-25. ^ a b "Premiere: Tinashe f/ A$AP Nast "Who Am I Working For? (Remix)"". Complex. 2013-04-16. Retrieved 2014-03-25. ^ Buyanovsky, Dan (2013-07-10). "A$AP Ferg Teases New A$AP Mob Album - XXL". Xxlmag.com. Retrieved 2014-03-25. ^ Baker, Soren (2013-09-29). "Kendrick Lamar, A$AP Rocky, Slaughterhouse Among BET Hip Hop Awards Cypher Participants | Get The Latest Hip Hop News, Rap News & Hip Hop Album Sales". HipHop DX. Retrieved 2014-03-25. ^ "Video: A$AP Mob f/ A$AP Nast & Method Man – 'Trillmatic'". Rap-Up.com. Retrieved 2014-03-25. ^ Zoladz, Lindsay (December 5, 2013). "Video: A$AP Mob: "Trillmatic" [ft. A$AP Nast and Method Man]". Pitchfork Media. Retrieved January 17, 2014. ^ "A$AP Mob A$AP Nast Method Man "Trillmatic"". Complex. 2013-12-03. Retrieved 2014-03-25. ^ "A$AP Ant & A$AP Nast "The Way It Go/Trillmatic"". Complex. 2013-07-09. Retrieved 2014-03-25. ^ Billy Johnson, Jr. (2013-12-04). "AAP Mobs Trillmatic Video: Count the 1990s References | Music News". Rolling Stone. Retrieved 2014-03-25. ^ "A$AP Nast, Method Man Take It to the '90s With 'Trillmatic'". Theboombox.com. 2013-12-04. Retrieved 2014-03-25. ^ Meara, Paul (2014-01-14). "Rap Release Dates: Juicy J, Meek Mill, Murs & Curtiss King, Killa Sha | Get The Latest Hip Hop News, Rap News & Hip Hop Album Sales". HipHop DX. Retrieved 2014-03-25. ^ "A$AP Nast — 15 Artists To Watch Out For In 2014". Complex. Retrieved 2014-03-25. ^ "16. A$AP Mob, Lords — The Most Anticipated Albums of 2014". Complex. 2014-01-06. Retrieved 2014-03-25. ^ "Straight Mobbin': A$AP Nast Drops "Trillmatic" Video Featuring Method Man". Atlanta Black Star. 2013-12-04. Retrieved 2014-03-25. ^ "A$AP Nast - XXL". Xxlmag.com. Retrieved 2014-03-25. ^ "You my dude and A$AP Is my fav rap / fashionable ..." Yamborghini.tumblr.com. Retrieved 19 January 2015. ^ Breihan, Tom (August 28, 2012). "Download A$AP Mob Lord$ Never Worry Mixtape". Stereogum. Spin Media. Retrieved November 9, 2012. ^ "Trillmatic (feat. A$AP Nast & Method Man) - Single by ASAP Mob". iTunes Store. Apple. Retrieved December 6, 2013. ^ "iTunes - Music - Hella Hoes (feat. A$AP Rocky, A$AP Ferg, A$AP Nast & A$AP Twelvyy) - Single by A$AP Mob". Itunes.apple.com. Retrieved 2014-06-11.